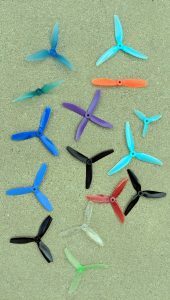 I’ve long been frustrated by the lack of publicly available information on how miniquad propellers perform. Sure — several folks have done thrust tests in their garage with different props, but these tests have all been done in still air. Our quadcopters rarely, if ever, fly in still air. If they did, our batteries would melt because almost every popular motor/prop combination draws in excess of 30 amps at full throttle. Every pilot who has flown a conventional 5x4x3 prop followed by an aggressive prop like the RaceKraft 5051s or the DAL Cyclones knows that the latter props give quadcopters substantial improvements on the “top end”. I wanted to see the numbers for that: how do different props perform when they are “unloaded” in moving air. To answer this question, I was initially drawn towards the idea of building a wind tunnel to do some NASA-style testing. Designs for wind tunnels are freely available online but as I dug into the nitty gritty details, I started getting disheartened. Most amateur wind tunnels do not exceed a flow rate of 30MPH and I wanted to see how these props performed at racing speeds: preferably at least 50MPH. The only way to accomplish this with a wind tunnel was to use a bigger fan – and the fans I would need would be industrial strength 3kW ventilation fans built for commercial buildings. They were not going to be cheap. 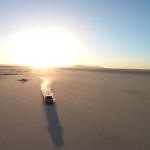 My wife came up with a solution to the problem – don’t use a wind tunnel, use a truck! I live in an area that is well known for aviation businesses and it turns out a lot of amateur “wind tunnel” testing has been done this way. 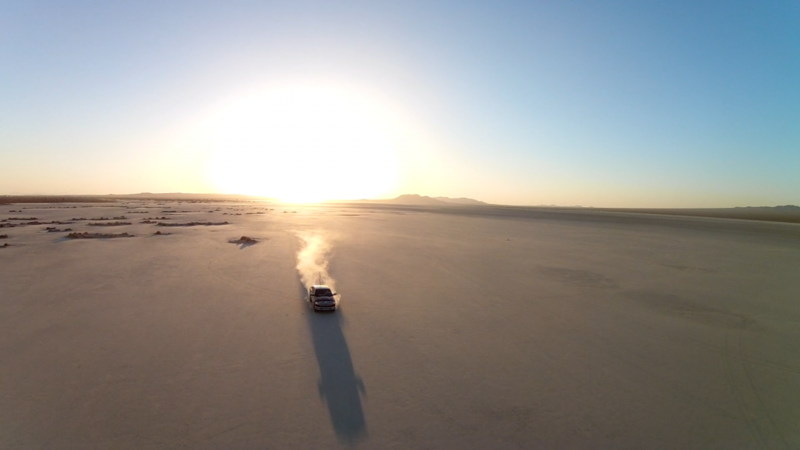 The concept is pretty simple: build a test rig that extends the airfoil well above the truck’s profile, go someplace flat, and drive a specific speed while measuring the results. This is something I could afford. 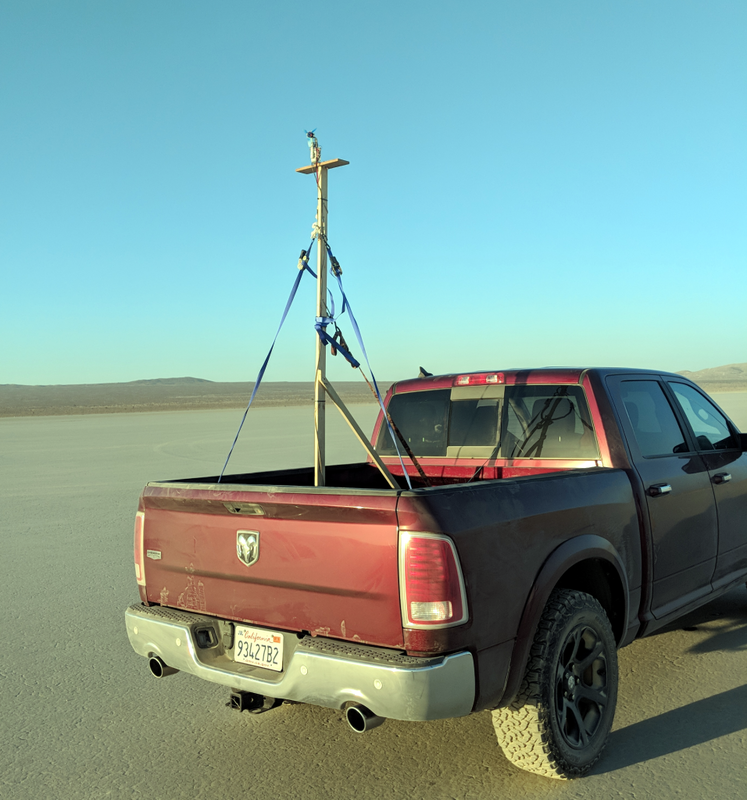 With the basic concept decided on, I got to work putting together a wooden framework that would be able to extend my RCBenchmark thrust stand 10 feet above my truck bed. I originally built the entire thing from wood with struts in all four corners. I quickly learned that the drag of the wood combined with a 10 foot lever produced some pretty large bending forces as you got up to speed. That’s code for “I accidentally ejected my test rig from the back of my truck while driving on a road at 30MPH”. Mildly embarrassing. The construction is nothing special: just some wooden struts connecting a platform that rests on the truck bed with a smaller plywood platform that the thrust stand is bolted to. Per recommendations from RCBenchmark, the thrust stand is mounted facing rearwards so that only (relatively) low-speed incoming air is affected by the platform and the thrust stand. Here is the assembled thrust meter, ready to go. This article would not be possible without my RCBenchmark thrust test stand. I have a 1520 model that I bought shortly after it was released. It provides a platform for concurrently measuring thrust, electrical power and motor RPM in a scripted environment. This means I can write a small program that gradually ramps the throttle between two set points over a set time period and records all the aforementioned data while it does it. The only thing it is missing is an airspeed sensor. This would have been a nice feature to have to normalize the speed I drove during test runs — lacking this I opted to use groundspeed. I had two options for electrical power: I could wire the test assembly to my truck’s 12V battery, or I could use a large parallel configuration of 4S LiPo batteries. After some serious thought, I decided on the latter approach. The battery bank consists of three Turnigy 6000mAh 4S batteries. The batteries are low performance, rated at only 30C, but with such a large capacity this will not matter. I calculated that all of the tests would consume less than 5000mAh of power so this configuration should be more than sufficient. I ended up charging the battery bank halfway through the tests and put less than 2000mAh into it. The EFAW 2407 motors can generate an insane amount of thrust due to their thick windings. It represents a state-of-the-art miniquad motor. 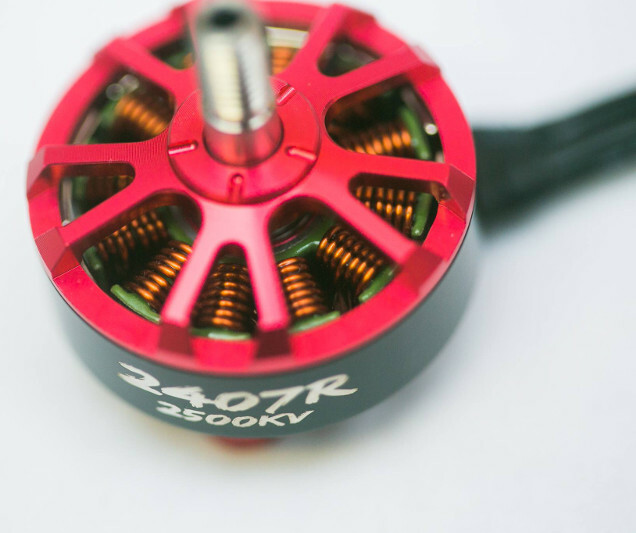 It is one of the most robust motors I’ve used with great active cooling and thick windings. It was the newest motor in my box of spares. The good news is it performed brilliant throughout the tests; not giving me any issues and staying quite cool. It did have one issue, though: this motor is fine pulling well over 40 amps continuously in static tests with aggressive propellers, and I do not have BLHeli_S ESCs rated for 40A continuous. To get around this, I adjusted the script my thrust stand uses to only ramp up to 70% throttle. I admit this is a suboptimal situation, but it should still do a good job showing us how different propeller profiles perform at different airspeeds — which is the goal of this test. As mentioned above, I used a Littlebee Summer 30A BLHeli_S ESC for the test. Not much though went into this other than the fact that I wanted this to represent the norm for ESCs these days. If I do future tests, I will get an ESC which can handle more power so I can test to full throttle without worrying about overload. DAL T5045Cx3 Cyclone – Very popular tri-blade with optimized airfoil. DAL TJ5045x3 – One of my favorite original “durable” props. 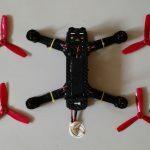 HQProp 5x4x3B – Probably the most popular tri-blade prop of all time. 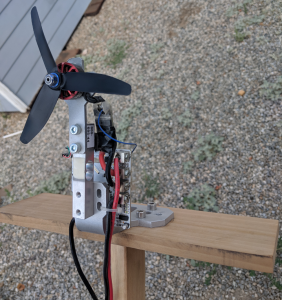 HQProp 5x4x4V1SB – How will 4 blades do? HQProp Durable 5x5x3 – A pitch-ier airfoil from HQProp. HQProp 5.5x4x3 – A trend in prop design lately has been to add slightly more diameter. Lets see how that tests. HQProp DPS “Notched” 5x4x3 – These are older props that have an interesting notch in the tips. 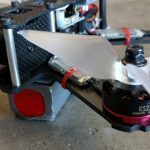 RaceKraft 5051×3 – Claims to be wind tunnel tested for quadcopter speeds. RaceKraft 5038×2 – Similar to 5051’s, but de-pitched and 2 blades instead of 3. RaceKraft RK5040x3 – A popular alternative to the HQProp 5x4x3. Gemfan Flash 5152×3 – An extremely aggressive prop from gemfan. Gemfan 5x5x3 – Will be interesting to compare to HQProp’s 5x5x3. Gemfan 5045BNx2 – An “old classic” to demonstrate standard 2-blade bullnose performance. HQProp Durable 6x4x3V1S – A 6″ prop to see how moving up a class will affect performance. HQProp 3x4x3 V1S – I had this lying around and was curious to see how microquads perform in this regard. I want to throw a shout-out to HQProp who have been sending us props for a couple of years now – your support of our site is definitely appreciated! Picking the location was probably the easiest part of the test. 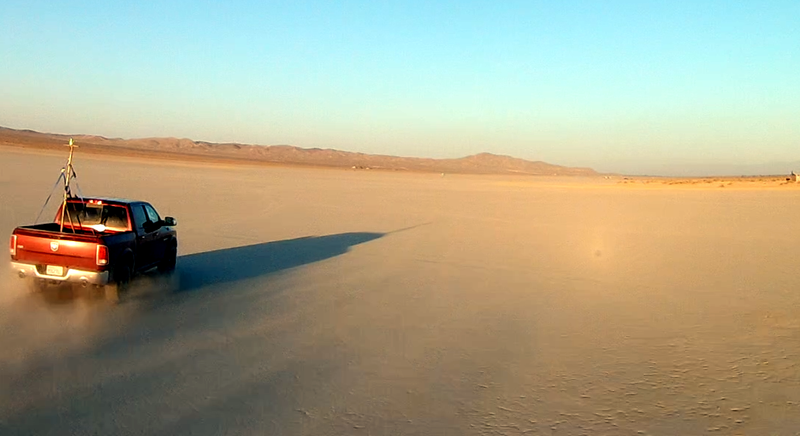 I live near the famous El Mirage dry lake which provides a perfect environment for this type of test: flat, long and practically empty during the summer. After some successful demo tests on empty local roads, Tyler & I headed out for a hot weekend of prop testing, camping and beer. In part 2 of this series, I go over the testing methodology and post the results. Check it out!